Under most circumstances, a vividly green drink might not seem quite so appealing. However, green is definitely the color of the day on St. Patrick's Day. People wear green clothing, some restaurants serve green eggs, and shamrocks abound. So, why not celebrate with a few green cocktails to show your affinity for all things Irish? 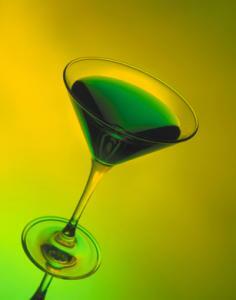 The following cocktails are all made green either by adding green-colored alcohol or a little green food coloring. Either way, the result is a collection of St. Patrick's Day green drinks sure to tickle the fancy of partygoers. You simply can't walk into a bar on St. Patrick's Day and not find green beer. If you're hosting your own party at home, making your own green beer couldn't be easier. In a frosty mug, pour the blue curacao first, and then slowly add the beer. 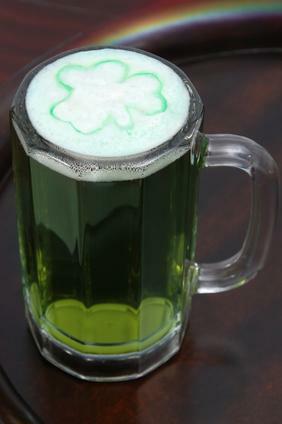 The two combine to form a green beer with a light green head. This recipe puts an Irish spin on the Jack's Bagpipes cocktail. Add ice to a Collins glass, and then add the whiskey and schnapps. Place one drop of green food coloring in next. Then fill the rest of the glass with ginger ale and give it a slight stir. There's no Irish connection to vodka or schnapps, but this green apple martini will certainly look Irish amongst other green cocktails on St. Patrick's Day. In a shaker with ice, combine the ingredients and shake briefly. Strain the beverage into a martini glass. You may need to experiment a little to find your ideal balance of green coloring and mint flavor in this martini. Add a little ice to the glass of a Boston shaker and pour in the ingredients. Give the mix a stir, and then strain the drink into a cocktail glass. Garnish the beverage with a sprig of fresh mint. This is simply a green version of this classic St. Patrick's day cocktail. In a rocks glass filled with ice, combine all three ingredients and stir. Add more or less bitters to this cocktail as you prefer. In a shaker with ice, combine all the ingredients. Shake and strain into a cocktail glass. Garnish with a green maraschino cherry. It's easy to get caught up in celebrating St. Patrick's Day, and over indulging is a definite risk when there's a crowd of fellow revelers there to urge you on. Remember that it takes the average person about one hour to process a single cocktail through the body, so pace yourself and leave a couple of hours at the end of your party to sober up before you hit the road. That way you can enjoy many more St. Patrick's Days, and green cocktails, in the years to come.